Start safely – When using cutting tools at home, always start by donning safety gloves and eye protection. Adopt safe cutting practices – Make your cuts slowly and accurately and always cut away from yourself. Take more care when exiting a cut because your cutting tool will likely cut through the final edge of your foam at a faster rate than it does in the middle of the foam. 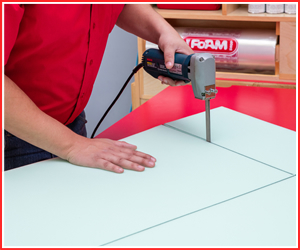 Use the best equipment possible – While foam can be cut with any sharp blade such as scissors, an exacto or kitchen knife we strongly recommend you use proper tools and equipment. An electric turkey carving knife is the best at-home-tool for creating a nice, smooth cut and is the closest to our own cutting equipment that’s easily available. Using this type of knife will help you avoid the jagged, uneven edges that are common when using a different type of knife (the quality of the edge you require will ultimately depend on how you intend to use the foam). If you find yourself needing help in the cutting stage, stop by and get direction and advice from our helpful staff at a convenient location near you.